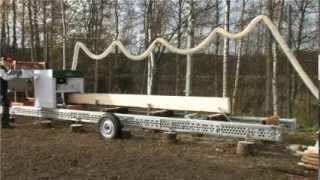 The log moulder LM410 also works as a jointer/planer for beams of dimensions up to 600 x 600 mm. Available both for petrol engine and 3-phase electricity. The track width is adjustable and fits most brands of band sawmills, such as LOGOSOL-NORWOOD, Woodmizer, Solidsaga and Lennartsfors. Fits on most brands of band sawmills, e.g. LumberMate and Woodmizer. Rail width standard 825-960 mm (32 9/16"-37 7/8"). Suitable for both narrow, flat and angled rail types. Flexible wheel suspension which can guide on the inner or outer side, or both sides, of the rails. If the width of the rails does not correspond, adaptor plates can be made for you. The same is true if the two rails have different heights. There are adaptors ready for Jonsered/Lennartsfors/Serra-Filius, Woodmizer LT15, etc. Planing knives are included as standard equipment. The same cutter type as PH260. 4 kW (6.5 hp) electrical engine. 9 kW (13 hp) gasoline engine. - Precision log posts, three pack. - Posts with wire for power cable and chip hose. - Hundreds of different standard molding knives (see our Molding Knives Catalog), including traditional Scandinavian log house molding up to 200 mm (8") wide. Custom-made molding knives can be ordered. Precision Log Posts, LumberMate 2000, 3 pcs.